Please tell me a little about your short story collection Tok Dalang and Stories of Other Malaysians and your play The Trial of Hang Tuah the Great. 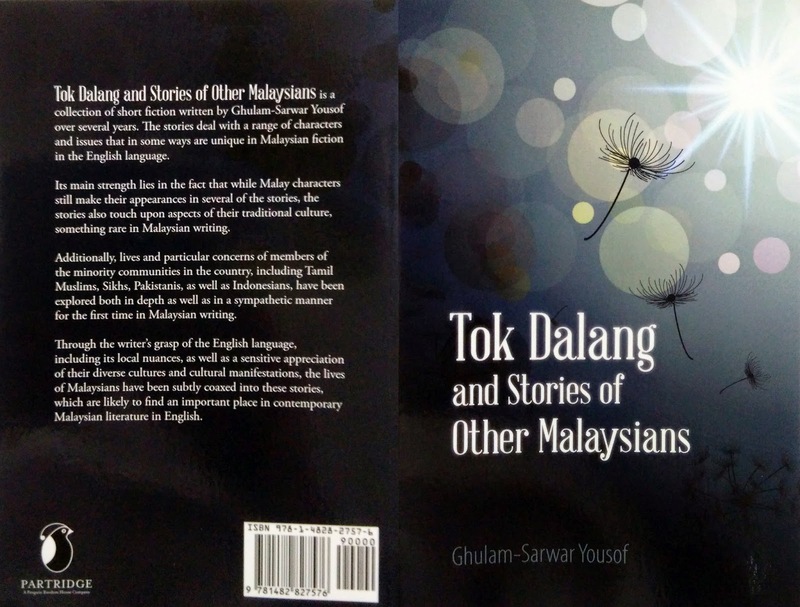 Tok Dalang and Stories of Other Malaysians in a collection of nine short stories written over the years. Each of them is a distinct attempt to get into the “soul” of a segment of Malaysians. I have focused on minorities such as Tamil Muslims, Sikhs, Punjabi Muslims, and Indonesians in about half the stories. The stories have all come from my own personal background as an Indian-Muslim, or Pakistani, and as an expert in Malay culture and traditional theatre. 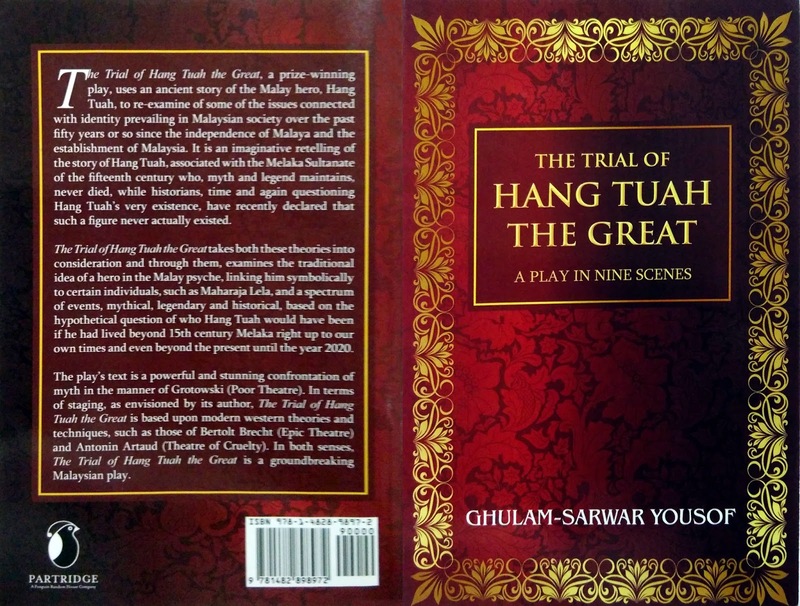 The Trial of Hang Tuah the Great deals with an important Malay hero. It’s a play in nine scenes that confronts the idea of the hero in Malay/Malaysian society both in terms of history as well as of recent developments in Malaysia, particularly since the May 13 1969 race riots. The play combines several highly important Western theatre techniques of writing and staging that come from the movements initiated by Grotowsky (Poor Theatre) and Antonin Artaud (Theatre of Cruelty). In that way this is a ground-breaking piece of dramatic writing. Once again the inspiration came from local ideas as well developments within Malaysian society, which in some manner are “confronted” by the play. What made you choose Partridge Publishing Singapore to publish your varied works? Given national policies in Malaysia, which are extremely restrictive when it comes to support in any language but Malay, as well as circumstances including attitudes of publishers who can think in terms of nothing but profits, a Malaysian creative writer in English has almost no chance to get published in the country. Then, there is also almost no readership in the country for serious creative writing per se. This can be easily be gauged from the lack of titles even in the biggest of bookshops, as well as in the libraries. Much that is written thus remains unpublished. Given that I have written so much, and continue to do so - both academic and literary work - I had no choice but to self-publish. I have previously published some work with small publishers. But that brings with it other problems, the most serious being that of distribution. I decided on Partridge to do a book of papers on Malaysian culture and then have gone on to publish four other volumes, all five within 2014. Their affiliation with Random House and Penguin Books gave me a good impression of the company to start with. I saw two advantages - almost instant publication, as well as good distribution through the internet and so on. My work became accessible to the rest of the world. Tok Dalang was all done and on sale within four days on amazon.com and other online distributors. For that, and my play, responses have been positive. How would you describe the self-publishing process through Partridge from start to finish? The process is relatively simple. Once the text is ready a package is picked and work begins. There has to be some measure of direct involvement on the part of the author. This involves editing and proof reading, which can be tedious for a non-expert. Everything takes place through email with minimum direct contact between author and staff at Partridge. At times this can be unnerving. What kind of support have you received to market and distribute the book? As far as I know Partridge does not distribute hard copies in Malaysia. So copies are not available in bookshops. I have found this to be a disadvantage. Partridge expects authors to self-promote their books and even sell them, totally without any assistance from them. Copies have to be directly ordered from Partridge and paid for in advance. Booksellers can order direct, but I’m not aware of the terms and so on. Books take a couple of weeks to arrive. I have found all this to be a problem. On the whole I do not expect good sales in Malaysia. In some ways I am not concerned given the attitude I mentioned earlier - the lack of interest and so on. I am happy if my books reach a world readership. Would you recommend self-publishing as a path for other aspiring writers as opposed to the traditional route of trying to get published through a conventional publishing house? Yes, I would, given the situation and circumstance that have been outlined above, in countries like Malaysia. Things may be different elsewhere, such as in Singapore, where there is a lively book industry and international exposure for new works. Above and beyond this I would add, that strictly speaking, I would still prefer academic writing to be published by established publishers, given all the concern with credibility, university rankings and so on. The only problem is that established publishers may take years to get a book out. I have several ongoing projects. Right now I am working on a revised and updated edition of my well-known book, Dictionary of Traditional Southeast Asia, first published by Oxford University Press in 1994. Then there is a volume on the Ramayana characters in the Kelantan shadow play. Other projects include translations of ghazal poetry from Urdu to English, and a fun book called One Hundred and One Things Malay. I also hope to publish another collection of my poetry as well as another play. There is plenty to come in 2015 and beyond. A representative from Partridge Publishing Singapore has confirmed they are custom building a dedicated website for Professor Ghulam-Sarwar Yousof, who has five works due for release in 2015. Partridge provides editing, layout and design, online distribution, copyright registration, and marketing services to indie authors. For more information about their self-publishing packages please click here. Please vote in the poll to find Asian Books Blog's Book of the Lunar Year. See here for details. Currently, Bamboo Heart is in the lead, with A Madras Miasma second, and The Book of Sins third, but there is still plenty of time for that to change.